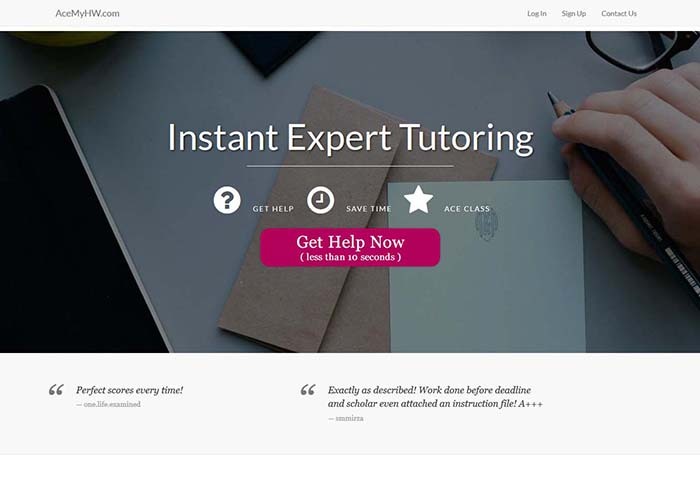 When you are looking for online homework assistance you are likely to come across the website acemyhw.com that specializes on the student’s assistance. If you are going to place an order do not hurry but check our review first. From the first glance, the website will feel quite cozy and neat. There is no odd information on its main page and nothing distracts your attention from getting help of professionals of this service. However, if you are the person who is likely to check the things first properly you will be unable to do so. There are no links or pages to read regarding the guarantees that you are given or the scholars, which you will work with. This point is quite disappointing taking into account the high rates of scam existing in the web today. Unfortunately, you will not be able to find out what the price for your order will be as there is no pricing section at ace my hw. One is asked to pay after the homework is completed, which has 2 sides: you can be sure that you will not be left without your task but you are unable to guess the approximate cost for your assignment’s completion. If you are looking for flexible prices acemyhw is not the place to pick as there are no any promo codes or discount programs presented in there. One of the basic factors to consider when you use the custom writing website is their reliability. First of all, you must be sure that they will not inform your professors about you seeking an assistance, secondly, that you will not be given a plagiarized work, which has been used by a number of student before. Also, there must be certain guarantees regarding the task’s refinement and money back policy. If you check acemyhw on these points, unfortunately, you will not find any plagiarism-free and money back guarantees. However, you can be sure about your privacy: the confidentiality of the customers is assured, with the small exception of customer’s testimonials, number of orders and inquiries published. Without doubts, they raise the reliability rate for other clients but not everyone would like to have them posted online. One of the great additional features that you are able to get is a Chinese version of the website. The number of Chinese students is growing rapidly and, without doubts, it is awesome that they are taken care about and can use the service in their native language. A convenient option at acemyhw is an opportunity to select the specialist, which will be working on your task and to chat with him or her before you start the ordering process. You are not able to find this kind of feature on the number of website, though it is crucial to know the person, which you delegate your assignment to. Concerning the customer support care, the client may get in touch with the team via live chat or leave an email for these guys but there is no chance to call neither writer nor the customer support representative. This is not convenient for people that prefer phone chats and assistance to online communication and means that you will not have any phone notifications in urgent cases, which is why you will have to stick to the internet during all the time of your order completion.